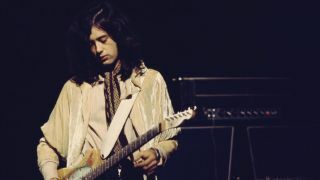 Not only is Jimmy Page responsible for some of the most memorable guitar riffs of the last century, but he's a mean lead guitarist as well. Here, we're looking at his rhythm and lead playing, which draws from blues, rock, folk and Indian music. Our riffs and licks cover several styles, from strummed psychedelic extended chords to fast blues-rock pentatonic sequences, so there's plenty to inspire you towards getting to the next level of your playing ability. Jimmy's typical rock powerchord approach is embodied within tracks such as Led Zeppelin's Communication Breakdown and Whole Lotta Love, delivered with aggression and precision. His folky side mixes with 60s psychedelia in tracks such as Kashmir and Black Mountain Side, while his trademark fast blues-rock solos can be heard in Rock And Roll and Dazed And Confused. The trick here is co-ordinating the sixth string palm mutes between the other notes. Try using alternate picking for the first three upbeats, and downstrokes for the rest. A typical Page trick is to shift between major and minor tonalities. The open strings are used as a drone, so make sure your fret hand angles up to avoid muting them. This tuning gives you a G major chord when you play the open strings, as well as C and D chords in 5th and 7th positions, so it's ideal for slide playing. Try placing the slide on your third finger, resting the first and second fingers lightly on the strings below the slide. This helps mute any unwanted noises and makes all your slide licks sound much cleaner. The first half of this lick uses a simple repeating idea. Barre your first finger over the first and second strings, using your second and third fingers for the bend. Bar 2 includes a three-note pentatonic sequence played with pull-offs for a smoother sound. Both ideas are great for milking a long improvised section, and can be happily extended over several bars. The third-finger three- and four-fret bends need excellent support from your first and second fingers; otherwise, your bends will be uncontrolled and out of tune. Be careful to mute the lower strings as you travel through the bend, aiming to push the strings out of the way. Moving above or below these strings causes lots of unwanted noise.